Do you know what the leading cause for injuries and death is for individuals over the age of 65? If you guessed falls, you are right. And you can probably guess where most of them occur? If you guessed inside the home, you are right again. When is the last time you have looked around your parent’s home to check how safe they are? We’ll discuss this topic on Day Four of the 30 Day Preparation Plan To Care For An Aging Parent. Welcome to the Raising ‘Rents Podcast. This show is sponsored by ComForCare, a national home care provider that will help you live your best life possible. Day Four of the 30 Day Preparation Plan is the next step in preparing a plan to become the best caregiver possible. Keep in mind as we go throughout this process that our primary goal for family caregiving, regardless of circumstances, is to provide a loved one with a comfortable, caring environment in which to grow old. It really doesn’t matter what stage your parents are in their aging process—a safe home is important to all of us at any age. But especially the older we are. According to the National Council on Aging one in three seniors fall each year. The risk of falls increases proportionately with age. At 80 years of age, over half of seniors fall annually. And these are the reported falls. Many older individuals won’t even report a fall to anyone. This is a serious issue especially when you consider that those who fall are two to three times more likely to fall again. And a little over half the older adults who are discharged for fall-related hip fractures will experience another fall within six months. I am not sharing this to scare anyone. I want to make everyone aware of this issue because though it may not be 100% preventable there are so many ways to minimize the risk of falls. And it begins with a home inspection for fall prevention. 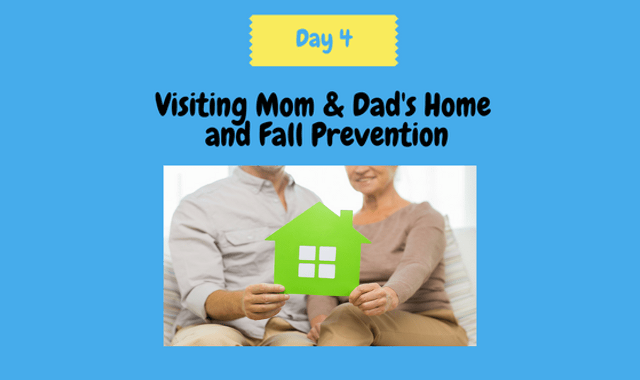 The next time you visit your parents, whether you or local and you go all the time, or you are long distance and home during the holidays visiting, it is a good idea to walk around the property and look for things that might cause a fall. I have done this for every home I have walked into whether they became my client or not in the home care business. Every single time I found at least one item that if corrected would decrease the chance of a fall. Many times it was multiple items. Especially the older homes but even newer homes need to be examined. I like to begin from the minute I get out of the car. I envision what the older adult goes through when they come home. Whether they park in the garage and have to climb stairs, or come through the front door which also has steps. Are there hand rails to help someone climb the steps? Are they close enough so someone can use both of them if they need them? Are the sidewalks even? During inclement weather, are sidewalks taken care of so they are not slippery or icy? Once in the home, I look to see how well lit the home is or can be. Hallways, foyers, each room I walk into I look for proper lighting, location of light switches, and night lights. Older homes for some reason never thought to put lights going down the basement stairs. This is a very important area and switches need to be on both ends of the stairs and plenty of lighting. I always ask where does the older adult spends most of the time? Usually there is a favorite chair. I look to see how easy it is to get in and out of it. Two arm rests and a stable chair is best vs. sitting on a sofa or a chair that rocks or swivels. I then look around the room to look for clutter and space between furniture. How easy is it to maneuver around room to room? Older adults tend to clutter up their home. Hallways, stairs and walking space within rooms must be clutter free. Also wires and extension cords need to be completely out of the way. In the kitchen, I look to see if there are things high up in cabinets and I ask how the person reaches them. I actually witnessed once, to the surprise of the adult kid watching, that a 90-year-old frail woman pulled out a rickety step ladder and was about to climb up on it. Is there gas or electric for the stove? Gas is a major issue if someone has dementia but one can burn them self on a electric range too. You can dismantle gas and lock the range if necessary. By the way, while you are in the kitchen, you should peek inside the fridge and pantry. Do they have enough food, is anything expired, are they eating the right things, any bug or mice issues? There are almost always throw rugs, especially in the bathrooms. And these are the toughest to have someone remove. You want to respect their wishes but safety is the most important consideration. Perhaps you can add double sided tape or use rugs that have a nonslip backing. And check all carpet to make sure it is not curling up or a trip hazard. Are we wearing shoes with non-slip soles? Slippers are not a good idea. Just think of the name for goodness sakes. Sorry, this was getting too serious. But really, slippers are a bad idea. Are there handrails for the all stairs and are they in good shape, not loose? In the bedroom, are there lights by the bed and a phone in case of an emergency. Is the bed the right height or is it too low or too high? What is the path to the bathroom—older adults go to the bathroom in the middle of the night frequently and the path needs to be free of obstacles and well lit or have a motion detector installed. In the bathroom, do they use a tub or a shower and does the floor have slip resistant material on it? Are there grab bars in the bathing area and by the toilet. Toilets are usually low from the older days and very tough to get off them. Many older adults will use a towel bar or a door handle to get up and that increases the risk of falling. In the bathing area, it is best to have a hand-held shower, and even a shower seat. This list is a good start and a little overwhelming. Remember, if you are doing this early in the process, baby steps are a good idea. Prioritize what needs to be done. Usually if your parents are not very steady when walking, or someone lives alone, it is a good idea to consider an emergency response system. They have some really cool technology today and can even automatically detect if someone has fallen. By the way, there are people who specialize in helping make sure a home is safe. They will even come out and give you a no obligation home inspection and make recommendations. You can look them up by searching stair lifts, ramps, and probably home modifications. I hope this is helpful and that you get a chance to do this. You really can help minimize the chance of your parent or an aging adult fall. So that’s Day 4. Join us for Day 5 as we talk about whether or not your parent should be driving anymore and how do you handle taking the keys away. Thank you for listening to the Raising ‘Rents podcast. This was Episode 13. If you have any questions or feedback, please go to our website www.raisingrents.com and click on the “Contact” tab. You can also find the show notes and references to anything we talked about. Until we talk again, remember that our parents raised us, the least we can do is help raise them. Talk to you later.